Thank you for your interest in attending Georgetown University! As you consider Georgetown University as a gateway to the next steps in your academic and career goals, we hope that you find information regarding the numerous programs Georgetown has to offer, connections to admissions offices, financing your education, and learning more about the campus culture and support for our military students. Georgetown University is an institution of higher education rooted with traditions of Jesuit values, distinguished scholars from around the globe, engaged student affairs professionals, and most importantly, a pluralistic student community. Georgetown University has a strong history with the U.S. military and today, our campuses are home to close to 1,200 military-connected students, including service members, veterans, and military families. Therefore, Georgetown University goes to great lengths to be military-friendly and values the experiences, skill-sets, and dedication that military students bring to our community. Through the many interactions we have with prospective military students, it is common to hear references that Georgetown is inaccessible academically and financially, but please know that Georgetown University offers realistic opportunities with your preparation and dedication. The Veterans Office connects military-connected students with the resources they need to successfully transition from combat to classroom to career. 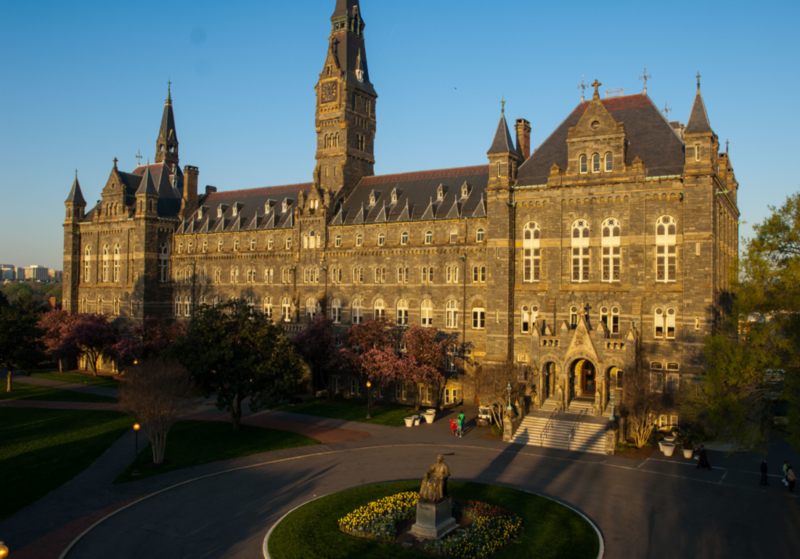 Our office serves as a liaison and advisor to ensure prospective and current military students are connected to partner offices to receive accurate and comprehensive information as students consider applying to Georgetown University. In addition, the team can assist with answering questions around resources and services that foster a campus for military-connected students to thrive and succeed. Questions pertaining military benefits options including the GI Bill®, Tuition Assistance (TA), and Advanced Civil Schooling Programs (ACS) can be may be answered on the FAQ section of the website or emailing veteranservices@georgetown.edu. A list of internal and external list of military-specific scholarships can also be found on the Veterans Office website. For information regarding our academic programs and admissions process, please visit the Prospective Student Resources page.